Western blot analysis of extracts from various cell lines using Methyl-PABP1 (Arg455/Arg460) (C60A10) Rabbit mAb. As expected, PABP1 methylation is decreased in CARM1 knockout (-/-) mouse embryo fibroblasts (MEFs). 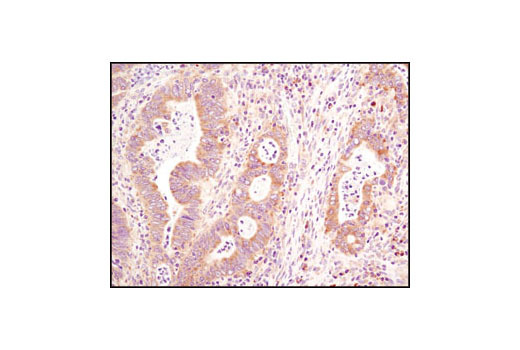 Immunohistochemical analysis of paraffin-embedded human colon carcinoma using Methyl-PABP1 (Arg455/Arg460) (C60A10) Rabbit mAb. 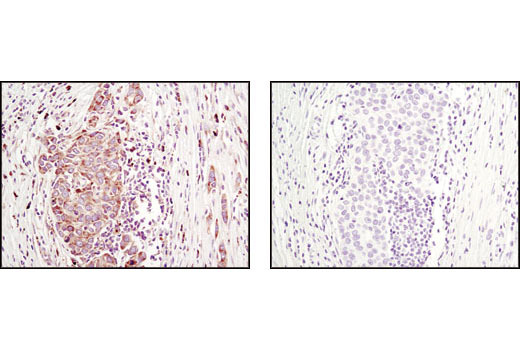 Immunohistochemical analysis of paraffin-embedded human breast carcinoma using Methyl-PABP1 (Arg455/Arg/460) (C60A10) Rabbit mAb in the presence of doubly unmethylated PABP1 control peptide (left) or antigen-specific peptide (right). 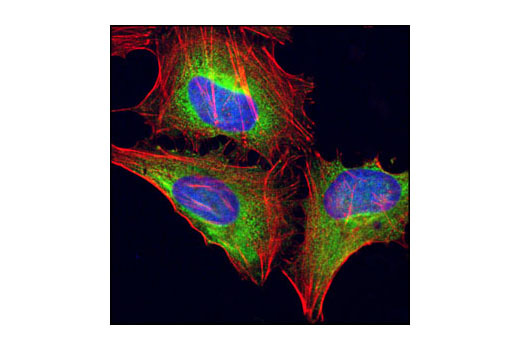 Confocal immunofluorescent analysis of HeLa cells using Methyl-PAPBP1 (Arg 455/Arg460) (C60A10) Rabbit mAb (green). Actin filaments have been labled with DY-554 phalloidin (red). Blue Pseduocolor = DRAQ5™ (fluorescent DNA dye). 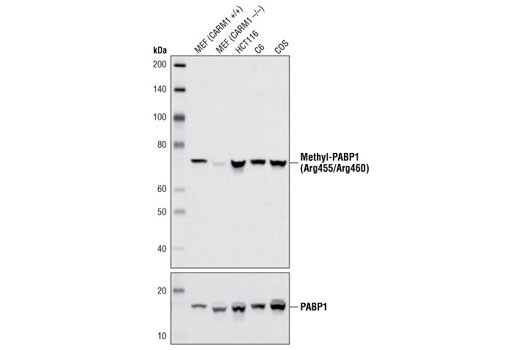 Methyl-PABP1 (Arg455/Arg460) (C60A10) Rabbit mAb detects endogenous levels of PABP1 only when methylated on Arg455 or Arg460. Monoclonal antibody is produced by immunizing animals with a synthetic peptide corresponding to the sequence of human PABP1 in which Arg455 and Arg460 are methylated. Poly(A)-binding protein 1 (PABP1) associates with the 3' poly(A) tail of mRNA and also eIF4F (1,2). eIF4F is a complex whose functions include the recognition of the mRNA 5' cap structure (eIF4E), delivery of an RNA helicase to the 5' region (eIF4A), bridging of the mRNA and the ribosome (eIF4G), and circularization of the mRNA via interaction between eIF4G and the poly(A) binding protein (PABP). PABP1 has been shown to have multiple functions including translation initiation, mRNA stabilization, and mRNA turnover (3,4). Phosphorylation of PABP has been shown to enhance RNA binding in eukaryotes, and PABP1 has been shown to shuttle between the nucleus and cytoplasm (5,6). PABP1 is methylated on Arg455 and Arg460 by the CARM1 protein methyltransferase (7,8); however, the function of this methylation has yet to be determined. Sachs, A. B. et al. (1986) Cell 45, 827-835. Piron, M. et al. (1998) EMBO J. 17, 5811-5821. Caponigro, G. and Parker, R. (1995) Genes Dev. 9, 2421-2432. Sachs, A.B. and Davis, R.W. (1989) Cell 58, 857-867. Le, H. et al. (2000) J. Biol. Chem. 275, 17452-17462. Afonina, E. et al. (1998) J. Biol. Chem. 273, 13015-13021. Lee, J. and Bedford, M.T. (2002) EMBO Rep 3, 268-73. Yadav, N. et al. (2003) Proc Natl Acad Sci U S A 100, 6464-8.